OPPO F9 Pro with triangular top-notch spotted in official poster - Playfuldroid! 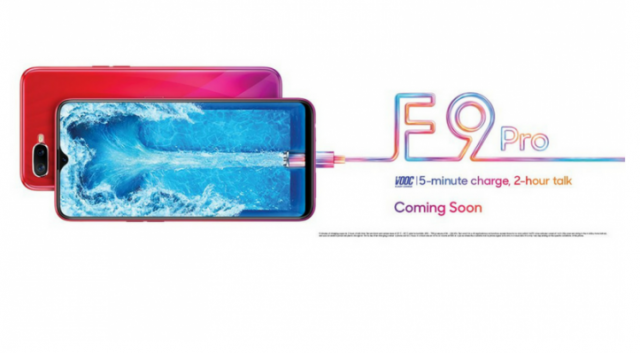 Although OPPO has yet to officially announce their upcoming OPPO F9 Pro smartphone, but the Chinese company had already put up its promotional poster on their official website earlier today. The promotional poster leaves nothing to imagination as it reveals the entire front panel design of the OPPO F9 Pro which shows off a triangular top-notch that functions as a selfie-cam. That of course, reminds us of the Essential phone which has been slowly fading away from our memory as the company has been exceptionally quiet in recent months. Anyway, the OPPO F9 Pro will also be featuring a horizontally arranged dual-camera setup on its rear chassis which is also expected to house a fingerprint sensor as well. As seen from the poster, the device’s back panel also has a rather interesting red to violet gradient-like hues. Similar to last year’s OPPO F3 Plus, this upcoming handset will also be coming with the VOOC fast proprietary charging capability which is able to charge from flat till half-full battery in 30 minutes. As for its other key specs, I believe we’ll have to wait till its official launch day to find out.